The Corewise Patented Automatic Core Saw is the most technologically advanced core cutting machine and well known to be the safest and most practical choice in the industry for all core cutting applications. Invented by Frank Frisina, the original inventor of the Almonte Core Saw, Frank has continue to develop and advance the core saw under the Corewise brand. In an efficiency and safety driven market, there is no room for accidents, which is why we recommend you keep your core saw operators safe with the right core saw. for it. Not only is it a very reliable piece of equipment, but it is also extremely safe to use. We typically supply the 3 phase Core Saw to the bulk of mine sites, however we do have a Single Phase Automatic saw available too. The Single Phase core saw is designed for smaller exploration programs, where only smaller amounts of core need to be cut, but where operator safety is a priority and manual core saws aren't suitable to the end user. The 3 Phase Saw will typically cut 5-6 times faster than the Single Phase Saw, simple due to the power of the saw, the 3 Phase being 7.5Kw and the Single phase drawing from 2.2kw. 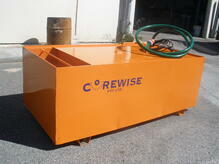 Designed and built in Australia, Corewise Automatic Core Saws are a premium Galvanised and Stainless steel construction, with all internal bolts being Stainless steel to increase machine lifespan. They have Aluminium composite sheet panelling, which stops vibration and reduces noise levels, leading to less wear and tear on parts and increased operator comfort. 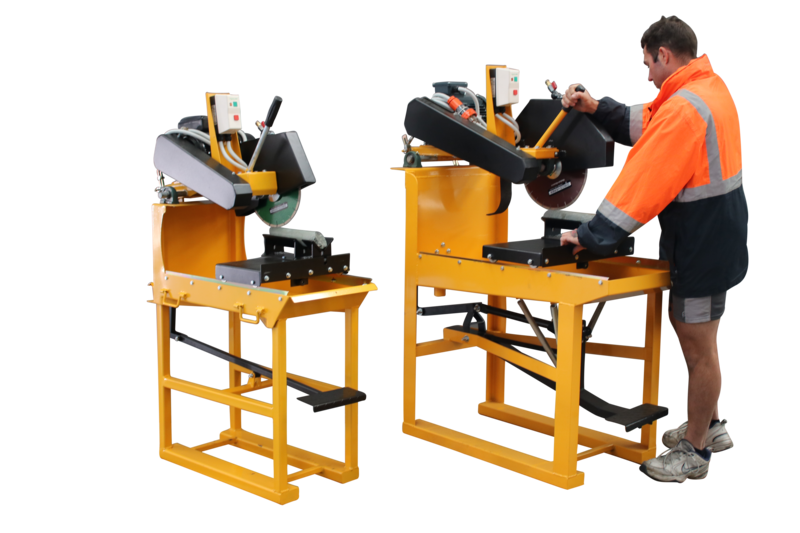 Both in forward and reverse the saw features an anti-jam system ensuring that core never jams which can cause potential operator hazards. Fitted to the core saw is a proximity sensor which automatically cuts the power when body parts come within the blade area or when the blade housing is lifted. 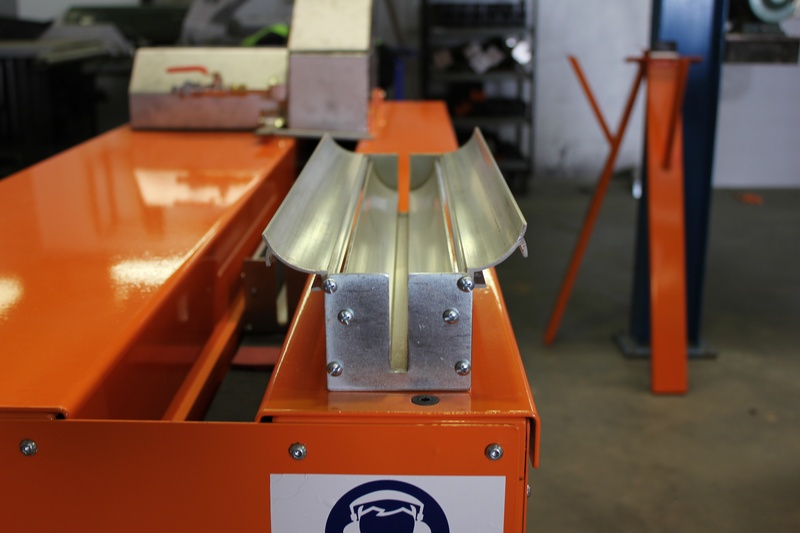 To compliment this feature, the saw is also fitted with Dynamic braking, ensuring that the blade stops immediately, which makes the difference between absolutely safety and loss of limbs or fatal accidents. The saw is driven by a new chain feed system, (shown left) opposed to the older style ‘pusher' lugs, and allows operators to instantly feed core without having to wait for pushers. So again this increases productivity without compromising safety. 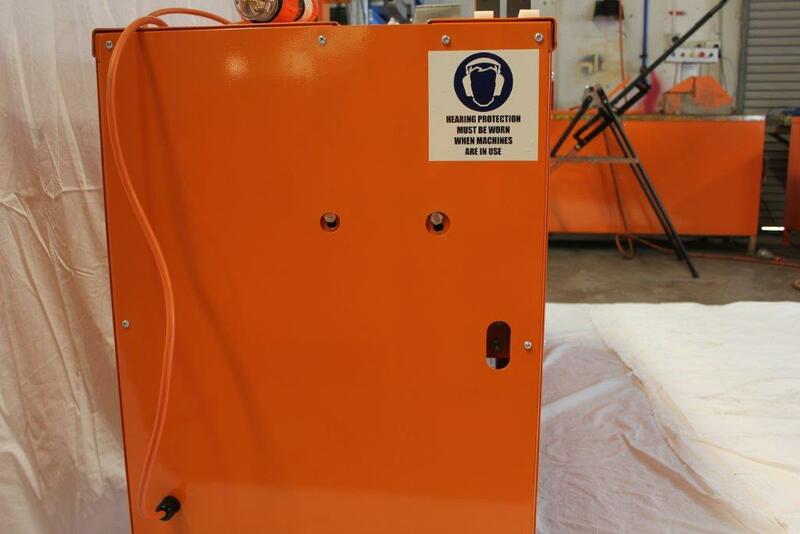 External Grease points (shown left, holes in the middle of the machine) for easy access – no requirement to 'open up' the saw to grease and maintain all internal parts like older models. This has proved that the operator will maintain the saw, and keep the regular greasing up to date as it's easy to accomplish, leading to less downtime and breakdown of parts, saving time and money. The main feature to note is this machine is the only saw with a 110mm core feed channel in which the user places the core guide, verses the traditional machines that have a narrower 90mm gully. This means that a Broken PQ Core Guide will fit into the gully with ease and also ensures the core guides will never ride up during operation, like the feedback we received on the older 90mm gully machines. 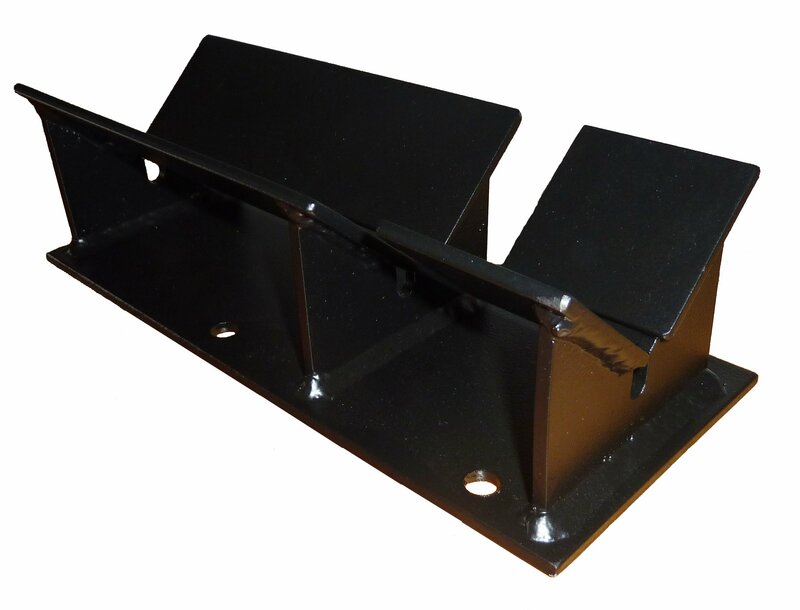 Adjustable anti vibration feet, the core will always be level no matter on the operation ground surface. The Corewise track record is Nil LTI or LTA ever reported. 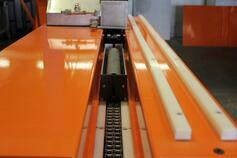 All saws are supplied with a 12" (300mm) Blade, a V-Core Guides, and N2 and H Broken Core Guides. NOTE: Only 12" (300mm) Core Blades fit the Corewise or any other brand of Automatic Core Saws, so please be aware of this when re-ordering blades. 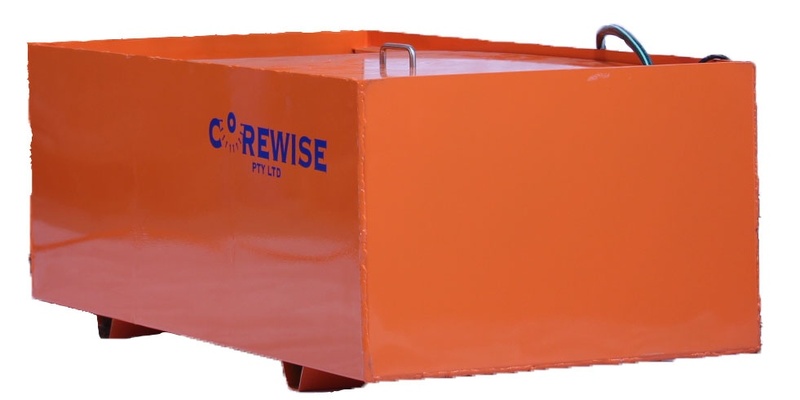 Built in conjunction with the Corewise Automatic Core Saw, the water recirculation tank is constructed from powder coated aluminium with 3 stage settling tanks, submersible pump, mesh basket, lid and hose with fittings. This can be bought as an available extra. When shipping and sending to remote locations or internationally a crate is built specifically to protect the saw in transit. 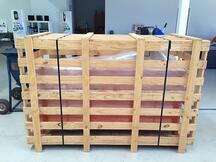 For export these are Heat Treated and Fumigated for customs purposes. 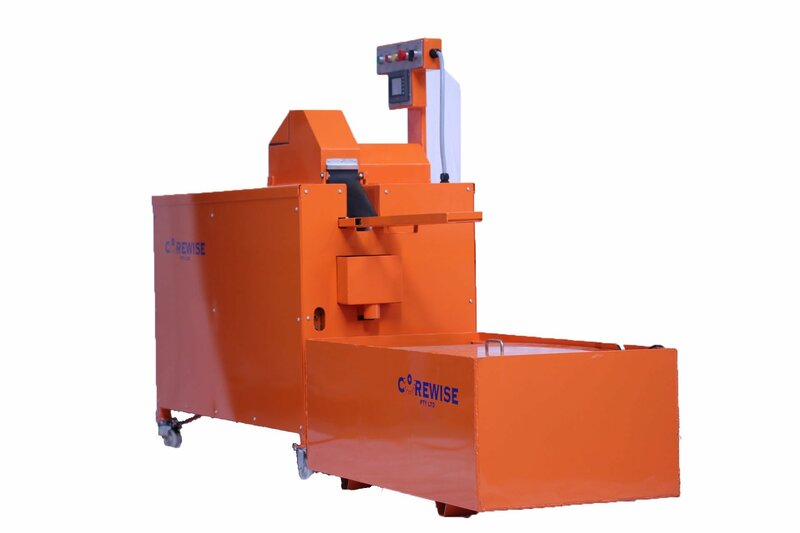 The 3 Phase Corewise automatic core saw is driven by a high efficiency 7.5kW (10hp) electric engine that gives it enough power for hard cores and to ensure longer blade life. 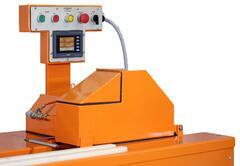 The smaller Single Phase Core Saw is driven by an 2.2kW electric engine. 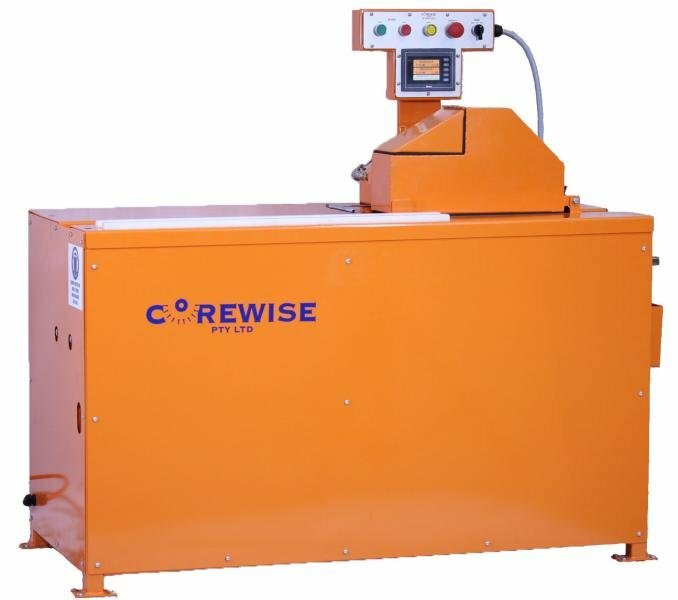 The Corewise automatic core saw can be fitted with various hardware to ensure compatibility with most power supplies overseas. 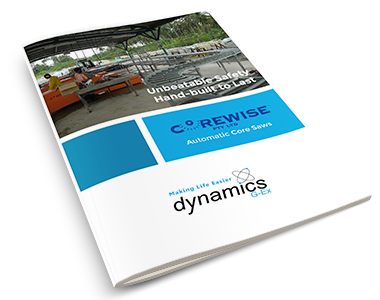 Dynamics G-Ex can ship our Corewise Automatic range of Core Saws, to any location within Australia, or through our Export Warehouses in Perth and Queensland. We have previously supplied a number of countries worldwide including into New Zealand, PNG, Africa and the whole of the Oceania Pacific region. We strive to stock the Auto Core Saw for immediate despatch at all times. The Corewise core saw is backed by a 12 month warranty that covers the motor, gearbox and components. Blades and chains are not covered under the 12 month warranty. Note: These units can sometimes be referred to as Core Cutters, Auto Core Cutters or similar to assist users finding the right product when searching!